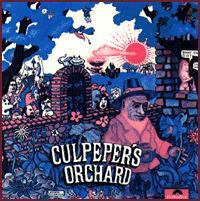 Culpeper's Orchard is a great Danish psych/rock group that put out three albums, of which this is the only one to make the transfer to CD, so far. The first time you listen to the opening strains of "Banjocul," you'll think, "What did I get myself into?" But then comes the opening chords of Mountain Music and you'll know you are in for one fun guitar jam for the entire album. Though definitely in the psych vein, Culpeper's Orchard isn't a rehash of the '66-'69 psychedelic bands or the "west-coast sound." Instead, the band takes intense electric jams that dissolve into beautiful folk-like acoustic arrangements and harmonized vocal melodies. Even the lead guitar is clean and jangling, eschewing the popular fuzz-tone of that era. 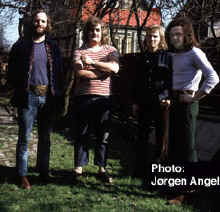 The Orchard combine known styles with Danish-folk arrangements into an original style distinctly their own. Hendrikson's electric lead played over driving dual acoustic rhthym guitars never fails to get me out of my chair and bopping 'round the living room. His lead guitar style in "Gideon's Trap," "Your Song and Mine," and the two-part "Mountain Music" draws heavily upon Eric Clapton during EC's time with John Mayall and Cream. This is most obvious in "Mountain Music Part 2," where he plays many classic Clapton licks from the Bluesbreaker album in homage to Eric. Though drawing from Clapton, Hendrikson doesn't wear it on his sleave, having developed a unique style of his own. Don't look for outstanding technical ability or phenomenal musicianship because you won't find it here. Just expect some good solid psych 'n' roll and you'll be as happy as I am with this album. Highly recommended. A completely different beast from the usual, this obscure Danish group produced a really underrated album in 1971 that should please those fans of innovative sixties acts. This album is amazingly stylistically diverse. Opening with a banjo/vocal ditty, you really have no idea what is going to happen next as Culpeper heads into a great rock flight like the best of the early Vertigos with Jack Bruce on vocals. Strong point of this group is the lead guitarist who's tone and emotion causes this group to really excel. As the album progresses you hear the Byrds, the Beatles, Crosby Stills and Nash, Procul Harum, Chocolate Watchband, 13th Floor Elevators, Black Sabbath, Deep Purple, the list goes on. The way it all comes together is extremely powerful and in my opinion far better than much of those bands music. In truth this is like an amazing tour into the late sixties and early seventies by a simply excellent band. Song: "Mountain Music - Part One"
Song: "Teaparty For An Orchard"
Song: "Your Song & Mine"
Song: "Mountain Music - Part Two"
Source: Information found in a song lyrics section of a Russian web site: "Heliophysics, Internal Structure and Seismology", which is published by a small group of scientists working at Sternberg Astronomical Institute, which is a part of Moscow State University. Culpeper's Orchard first identified to Culpepper Connections! by Bill Russell. Origin of Name: There were no Culpeper's in this group, and the origin of the group's name is unknown. A likely explanation is that this Danish group picked up the Culpeper name from Culpeper House, a world-wide chain of herbal shops named for Nicholas Culpeper.